We are offering Control Cabling Services that are rendered by our team of deft professionals; closely interact with the clients according to their needs. Apart from this, these services are imparted using the advanced machines in such a way to provides utmost efficiency, reliability and promptness. These services are provided in complete conformity with the industry quality standards. Due to passage of time, we are able to render Cabling Services. 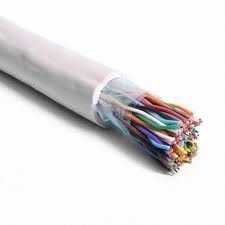 Without any trouble, our experts install cables in numerous sectors. These services are rendered by our industry professionals who use contemporary technology in obedience with the set quality values. Offered services can be modified to meet the specific necessities of the customers. IEC 228: Conductors of insulated cables. Guide to the dimensional limits of circular conductors. IEC 331: Fire resisting characteristics of electric cables. IEC 332 - 3: Tests on electric cables under fire conditions. Part-3: Tests on bunched wires or cables.